I found this inspiring video on leather goods company ColsenKeane, definitely worth viewing on this bright but wet Friday morning here in England. 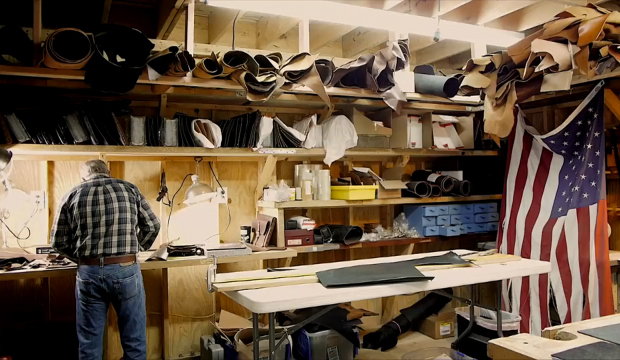 Founder Scott Hofert takes us into his workshop and his daily job, showing us what it’s like to be in their workshop cutting the leather and stitching together all these beautiful leather made goods. Scott has spent the last 25 years travelling to over 40 different countries and this inspired him to start the label after the disappointment of seeing so many cook-cutter line products all made in a factory with no love or care. The idea is to make products out of high quality leathers such as latigo, vegetable dyed leather or oiled leather, you can see some interesting explanations into the leathers that they use on the leathers page of their website. As with most of the stuff that we showcase on this website, it’s about function, simplicity, making everything stand the test of time. I think the products look structurally sound and it’s nice to hear that sometimes they spend up to ten hours making one satchel, quite some dedication to get each one just right. Anyways, I’d recommend watching on below to hear the full story and what the company do, some really nice close-up shots of the leather cutting and stitching. Enjoy.